Cycle Seahaven has arranged for our members to get 20% discount at Cyclon Bike Care. They do some great cleaning products including products specifically for e-bikes. The products are on par with Muc-Off. The discount code will run from 12th September 2018 thru to 31 December 2018. CYCLON – Keep Your Bike Smiling! Cyclon Bike Care was founded in 1985 and after 30 years has become the most complete, cleaning, high-quality lubricant and maintenance product line for the bicycle market in Europe. Now distributing directly to the UK, cyclists can get the ultimate in bike care products. or alternatively apply the code Cycleseahaven20 at the checkout when prompted. During last Sundays ride to Brighton Marina, one of our riders suffered a puncture. To save time I decided to use a puncture repair spray to keep us moving. The spray is designed to repair and inflate tubeless or punctured inner tubes instantly without tools and without taking the wheel off the bike. A couple of the ladies on that ride hadn’t seen this method of puncture repair before and were impressed by the ease and speed of the repair. They thought it was an ideal solution for ladies riding alone who aren’t confident about repairing punctures in the field; I know a few blokes like that too! So, for the benefit of those individuals that don’t know about this option, here is a link showing the product in action. The can is small enough to fit in a pocket or backpack and doesn’t weigh very much. It inflates the tyre as it seals the hole and more air can be added afterwards if required (I’ve never found this necessary on a 27.5 tyre). The manufacturers suggest that you replace the inner tube once you return home but again in practice I’ve found you can keep going (till the next puncture at which point a new inner tube is required). This spray, from Decathlon in Brighton, costs £2.99, but I’m sure there are other similar products/suppliers. The manufacturers say it will repair holes up to 1 mm wide but I’ve used it twice to repair tyres with small slashes of 3 mm and it’s worked fine (after a bit of seepage through the hole). So if you’re not confident fixing punctures or you simply can’t be bothered because it’s pouring with rain, cold and muddy (which is why I carry one on my commute) then you might want to consider giving it a go? That said, I would strongly recommend that everyone learns how to repair a puncture, because whilst this stuff is good it won’t fix everything. Dr Bike is Back! JUST! 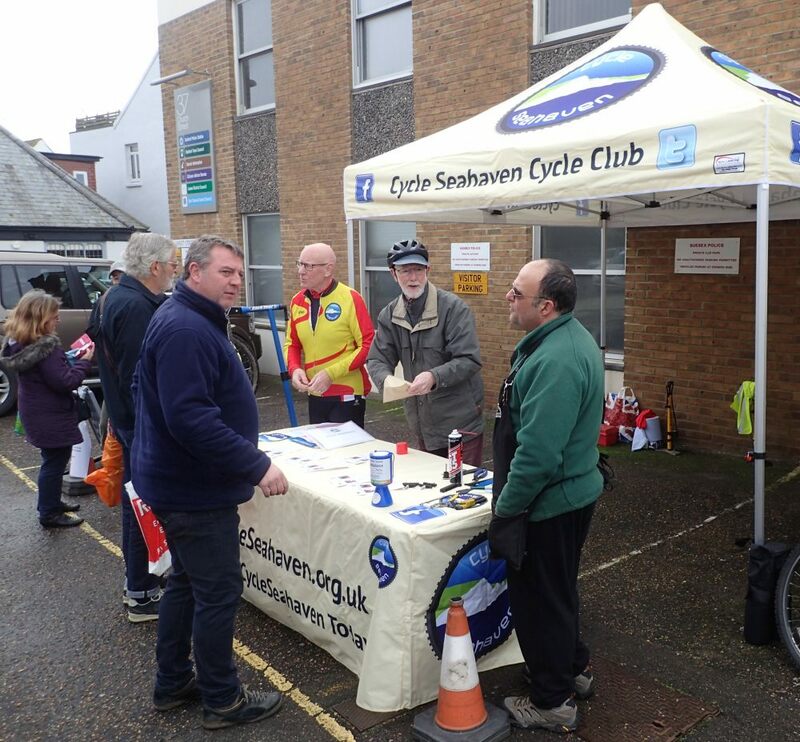 The final two Dr Bike Surgeries run by Cycle Seahaven will be at Seaford on Saturday 6th and Peacehaven on Saturday 20th October. ‘Dr Bike’ is a group of cycle enthusiasts from Cycle Seahaven who want to help local people to use their bikes more. If you are not pedalling because of dodgy brakes, stiff gears, rattles, creaks or soft tyres, then bring your poorly cycle to the Cycle Seahaven Dr Bike surgery. We are all passionate cyclists, some even have maintenance qualifications, but we will give your bike a safety check and try our hardest to get your cycle fixed, so you get back in the saddle! We do not offer a fully equipped bike repair shop – The area is fortunate to have two of these already – but we do have the skills, tools & enthusiasm to carry out basic repairs & maintenance. 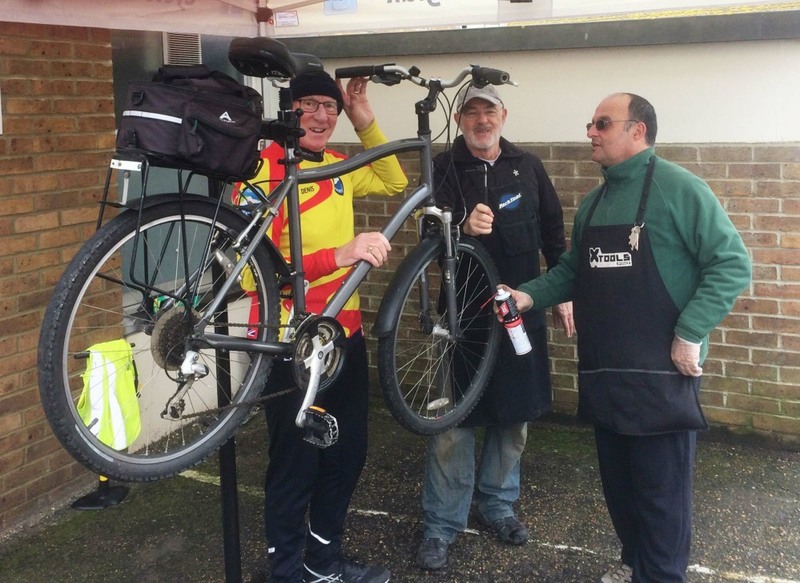 https://cycleseahaven.org.uk/wp-content/uploads/2017/12/Dr-Bike-SHS.jpg 318 500 Tony http://cycleseahaven.org.uk/wp-content/uploads/2012/04/CycleSeahaven2-300x298.png Tony2018-02-22 17:29:232018-10-02 10:26:30Dr Bike is Back! JUST! We arrived to set up for 10 am but already had a queue forming by 9.30…! Four ‘bike medics’ set to work and were kept busy until close of business at 12 noon – or more like 12.30 by the time we finished our last safety check and handed back the 20th bike we’d worked on that morning with freshly pumped up tyres. In many ways Saturday perfectly represents the Dr Bike thinking – we worked on bikes that were otherwise resting (rusting?) un-used in sheds or even in the garden. We don’t do major work but we do want to help present and future cyclists get, or keep, their bikes working. For more serious mechanical ‘challenges’ we normally advise riders to check out their local bike shop. And if you enter the shop with a better idea of the work needed, because of conversations with Dr Bike, then that’s good too. And, for example, one of our younger ‘customers’, and his Dad, took a very real interest in the work we were doing and got involved…the more you learn about how a bike works the better and easier cycling becomes! What seemed to work especially well was the teamwork. The session was fronted by a CS committee member who kept people informed, and amused, as they waited for a ‘medic’ to be available or just ran the stall and chatted ‘cycling.’ Other committee members and ride leaders popped in to help out with clearing up and one – you know who you are – supplied much needed cake! This typifies the CS approach to all things cycling, which normally involves a lot of smiles, food(!) and a fair bit of banter. We take very seriously the issue of cycling safety and a well maintained bike is a good thing in its own right – the fun comes from doing something we all enjoy. See you on Saturday 6th May…. A surprisingly warm Saturday morning - March 4th - saw the inaugural session of the new series of Cycle Seahaven's free, Dr Bike workshops in Seaford. This was something of a trial run. It generated lots of interest in bike maintenance, in Cycle Seahaven and attracted a new club member, plus numerous expressions of interest in our next session. We safety checked and/or worked on 4 bikes and advised on the work likely to be needed for other riders who had not brought their bikes with them. If you are not using your bike because of dodgy brakes, badly adjusted gears, rattles, creaks or soft tyres, then bring your poorly cycle to the Cycle Seahaven Dr Bike surgery for a check up! We’re at the Seaford Council Offices / Police Station car park on the 1st Saturday of the month, between 10.00 and 12:00. Dates for 2017 are : 6th May, 3rd June, 1st July, 5th August, 2nd September. We do not offer a fully equipped bike repair shop - Seaford is fortunate to have one of these already - but we do have the skills, tools & enthusiasm to carry out a full safety check, basic repairs & maintenance. And our aim is to help you do this for yourself! We are insured and some of us even have cycle maintenance qualifications! But we are all passionate peddlers who will try our hardest to get your cycle fixed and you back in the saddle! All the ‘doctors’ are volunteers and so our numbers vary, but we will usually have 3 or 4 on duty. We don’t use appointments so it’s a first come, first served system. If we won’t have time to fix it that day, then we will ask you to bring it to the next surgery. Wrap duct tape around the body of your bicycle pump and you always have a ready supply to repair torn pockets/clothing, frayed cables, or anything else that breaks or comes loose on a ride. It will even temporarily repair slashed/split tyres and fix a puncture if you keep the pressure low. Got a tip you want to share? Let us know from our CONTACT page.